Here's a confession: I've never been to Mexico. I married into a Mexican family, but I've never visited Angel's relatives in that country nor have I ever made it across the border. He's told me many stories of the times his high school coach used to drive the cross country team across the border into Mexico and have them run races, where they would win prizes of money, prizes that the coach would keep as his due after driving them all the way over there--and how this coach at least had the good sense to not allow any of the teens to drink the beer that was handed out freely at the finish lines of the races they ran. He talks about visiting his grandmother and grandfather...his grandmother is still living, and if Angel's to be believed, she's been 83 years old for as long as we've been married. I listen eagerly to Angel's tales of running races in Mexico and visiting his family there and waiting in the car for long hours during the border crossing...but I've never been. Fellow blogger Meg Gonzalez invited me to read and review her YA novel that has just been published: Sketchy Tacos. I was very intrigued when I realized that the story surrounds a young woman, Mila, on her first trip to Mexico. She's taken multiple Spanish classes but still finds herself flustered and barely able to communicate when she first finds herself surrounded by the Mexican host family she comes to live with (boy--can I relate! The classroom just doesn't prepare you for real life!). I read YA fiction pretty frequently. I like finding books that I can recommend to students...and sometimes, I just don't appreciate the overly serious tone of books meant for grown-ups. Perhaps I'm showing my age here, but in this novel, especially towards the beginning of the book, I found myself agreeing far more with Mila's parents and various adults than with Mila over her choices and future plans. I'm always talking to the characters in books I read and I found myself saying, "Hey, don't diss community college, student loans are no joke!" and "Teenage boys are terrible! All of them! Not worth it! Stay away! Stay away! Why aren't you listening to me?" Anyways...that's me. I don't like it when people have to learn life lessons the hard way...but the vast majority of people have to learn from their own mistakes, and so does Mila. The good thing is, she is willing to learn. This book is fun read, and a quick one if you're like me and read 100+ books in an average year (perhaps I should not admit that embarrassing statement. It's not my fault that the library is a 3 minute walk from my apartment, okay!). Now to convince Angel to take me to Mexico one day so that I, like Mila, might have the chance to climb a Mayan pyramid with an intriguing young man at my side...that's my favorite scene in the book, but that's probably related to my well-documented desire for adventure. 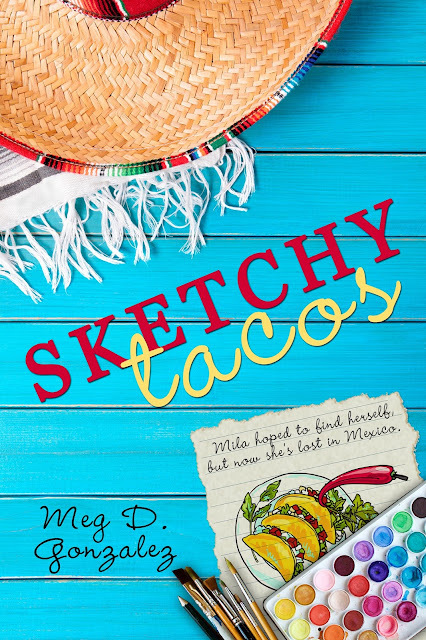 Sketchy Tacos is available on Amazon and feel free to visit Meg's blog to congratulate her on the book's launch! I received an advance reader copy in order to write a review, and all opinions are my own (it would be pretty wrong to go around stealing other people's opinions, don't you think?). Is there anywhere in the world that you really ought to have traveled by now but, for one reason or another, you've just never made it there? What's your favorite genre to read? My favorite genre is YA! I also love a good nonfiction book too. I read 180 books last year to be exact and I work at a library, haha! So I'm a big nerd and proud of it! :) Do you use Goodreads? I'd love to be friends with you over there if you do! I've never been to Mexico either, but I'd love to go some day! Thanks for sharing this book with us! I'll have to add it to my reading list :) Also, I find it really interesting that you've never been to Mexico, since you've traveled across the world. Hi AnneMarie! I hope you enjoy Sketchy Tacos ;) Do you have a place you've always wanted to travel to but haven't made it there yet? Sounds like a cute read. I'm so with you on agreeing with all the adults in books like this. I'm always like, "Stop treating your friends like that. Be responsible. Make better choices." haha!